On Sunday, October 16, the full moon will appear a bit bigger and a bit brighter than usual, since it will be closer to us than the average full moon. Called a "supermoon", this is the first of three in a row that will grace our night skies through the autumn. "Supermoon" is an unofficial term coined in 1979 describing a full moon or a new moon that takes place when the moon is closest to the Earth in its elliptical orbit. That spot is called the "perigee"—a distance of 221,526 miles. When it's a full moon at perigee, it is also called "super full moon." A full moon happens every lunar month, but is usually not at perigee when it does--that happens less than once per year. However, the actual definition of supermoon isn't as exacting, requiring it to be within 90 percent of the perigee distance to be considered super. So any full moon that is less than 223,694 miles from Earth is a supermoon. This qualifies the full moon of October 16 (at a distance of 222,367 miles) as "super". 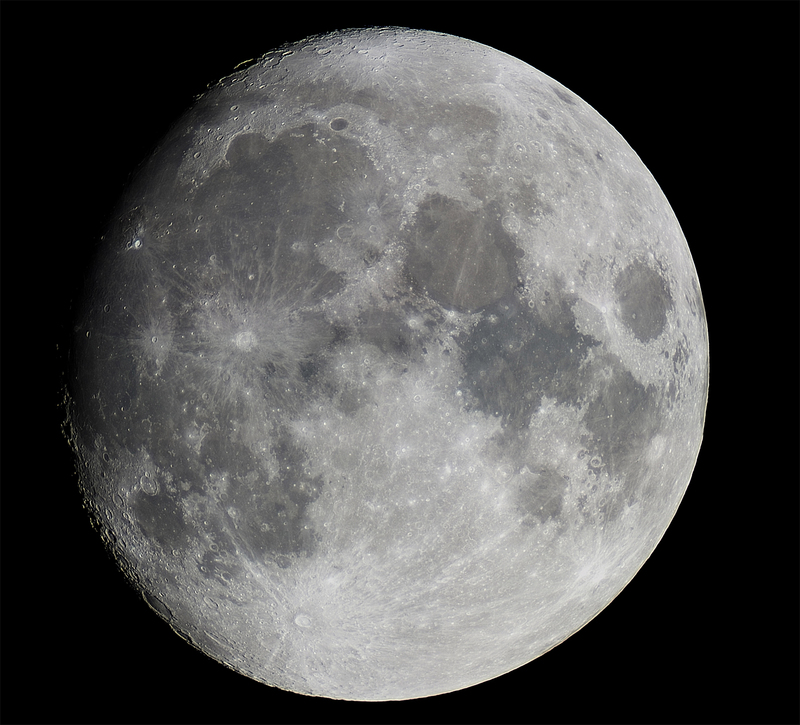 The December 13 full moon is a bit farther away (222,752 miles), but still falls under the line. November 14 brings us the closest supermoon of the year: 221,541 miles -- only 15 miles outside of the absolute closest distance. At a casual glance, a supermoon might appear like any other full moon. Size-wise, it's only 14 percent larger than a "micromoon" (yes, that's a thing too: A full moon that coincides with apogee, the moon's greatest distance from Earth). 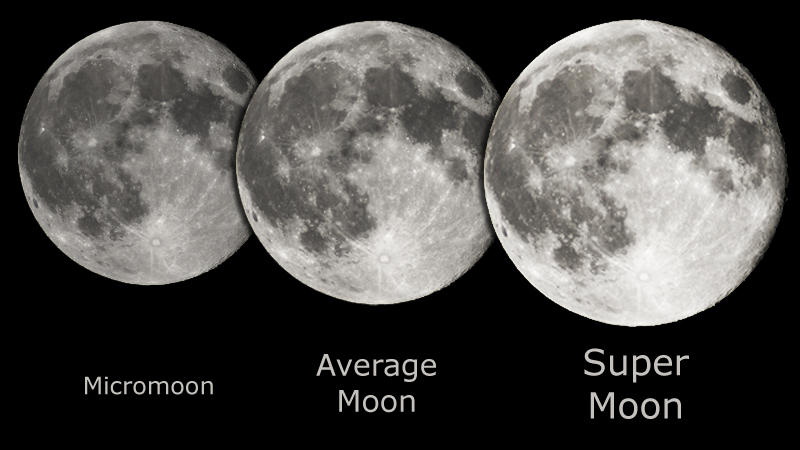 So unless you take pictures of the supermoon and micromoon and compare them, you probably won't notice the difference. The more notable effect is the supermoon's brightness, as much as 30 percent greater than its mild-mannered "micro" identity. Now that's something you can notice without comparing one month's moon to another. The moon, and the landscapes and clouds it illuminates, will just appear that much brighter. You might even want to put on sunglasses…. For the biggest supermoon experience of all, check it out just after moonrise, or before moonset, when the moon is close to the horizon. Then, it will appear even larger by virtue of what's called the "moon illusion:" an effect of human visual perception that makes the moon appear larger than it actually is. Can We Blame Anything on the Super Moon? Some have tried making a connection between supermoons and certain natural disasters on Earth, such as major earthquakes and tsunamis, though no scientific correlation between them has been found. Now, maybe it's worth mentioning that the new moon that takes place on Halloween will be a micromoon—the darkest and maybe most haunting incarnation of lunar apparitions!